Taglines: When two hearts are meant for each other, no distance is too far, no time is too long. Everyday, Nelia waits outside a store in Timog hoping for Delfin--a man that she lost 40 years ago--to comeback. Unwilling to forget the romance that she spent with him, she recalls their tale set amid the timeless beauty of Quezon City in 1970s. Will Nelia be able to move on? Will Delfin's love transcend through time? 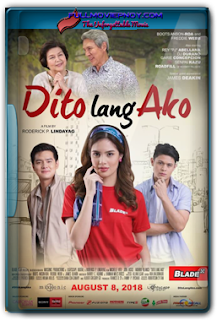 As Nelia and Delfin's story unfolds, 'Dito Lang Ako' becomes more than just a recollection of a past romance, it is an achingly compassionate story of heartfelt passion, tender moments and most of all, unselfish love.